It's Good To Know When Someone Has Your Back! 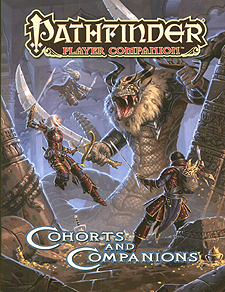 Prepare for your adventures to get twice as exciting with Pathfinder Player Companion: Cohorts and Companions! Double the daring and fun with all-new rules for turning your adventurer into part of a dynamic duo. Whether you're growing a towering treant to serve as your monstorus cohort or organizing a grand heist with your fellow thieves, Cohorts and Companions gives you the rules you need! New options allow you to make the most of your allies, or even make your allies from scratech! From binding outsiders to winning over artist patrons, this volume has cohorts ideal for any character concept. Character options to help class abilities benefit from a cohort's assistance, from bardic harmonies to ally-oriented rogue talents. Multiple new ways to gain and use cohorts including using magical beasts to serve as animal companions, conscripting teams of low-level recruits, and using magic items as cohorts. New archetypes that allow characters to focus on their cohorts, such as the esquire for cavaliers, construct rider for alchemists, and instructor for wizards. Tables arranged by theme listing dozens of new monster cohorts of many different creature types, along withtheir aeffective cohort levels. New campaign-focused rules allowing you to secretly recruit teams of criminals during downtime, win the love of enthusiasts of the arts, and arrange for contingency services! This Pathfinder Player Companion is intended for use with the Pathfinder Roleplayihg Game and the Pathfinder campaign setting, but can easily be incorporated into any fantasy world.